Social networking was all the rage in 2008. We have social networks like FaceBook, Orkut & MySpace to meet people. And then there are even social networks to meet people with special interests such as music, video, food, wine, cars, etc. You knew about it already. But, did you know there is a social network for discovering software, games and web applications? Wakoopa is a place to discover just that. Wakoopa installs a small tracker on your desktop and automatically creates your software profile. This lets you track what applications you use on your desktop and share it with your friends through widgets or on social networks like Facebook. 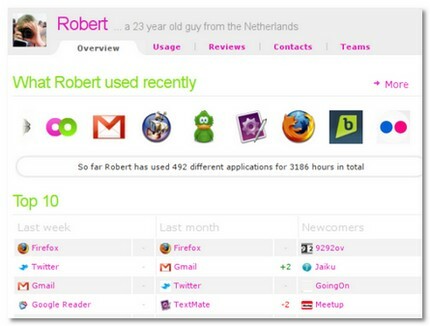 Wakoopa even tracks web applications like Gmail, Flickr, etc. Other than sharing information on the software and web apps you use with your friends, Wakoopa can also provide you with smart recommendations based on your own software usage. Your Wakoopa profile is a treasure trove of information on the software you use in your computer. You can see the software and web apps you use the most in a graph over time. Anyone visiting your profile can see the apps you have been using recently. It even distinguishes the apps that are being used actively and the apps that run in the background. You could even become a member of your favorite software/webapp by joining the team. This is a great way to find like-minded folks. Or if you were a software developer, you could create a team for your software and use it as a place for your users to hang out and discuss things. Another aspect of Wakoopa is that like forums, every member gets a reputation level starting with a ‘Novice’ and moving up the ranks to becoming an ‘Overlord’. This reputation page describes about specific levels and points you can get based on your software usage level. For eg, you get 100 points when you use over 1000 hours of software and will be on your way to becoming a Devotee (250 pts). As a blogger with a more than average appetite for new software and web apps, I am immensely interested in this service and can’t wait to try it out. I have created a Wakoopa account for myself and will be giving it a run for a few weeks and will post my thoughts here. If you are concerned about privacy issues like issues with myspace private profile, Wakoopa says you decide what’s displayed on your profile. Since I am on a Linux desktop at the time of writing this, I don’t have the tracker installed yet. But, if you are on Windows or Mac, you can start right away. Linux support is promised to come soon. If you are already on Wakoopa, don’t forget to ping me there or leave your Wakoopa profile here in the comment section. I would love to meet you there and see what software you use and recommend. Thanks for the information on Wakoopa. Your posts are awesome. Thanks for this info. This sounds very innovative, I will try it out and see what it comes up with for me. I never heard about Wakoopa before. Thanks for detailed review about this site. Owing to you I got know that there is such useful social network with the help of which one is able to discover software, games and web applications. Thanks for such detailed and comprehensive review on Wakoopa. It is really worth a try.